A cartoon about modern baby names and old-fashioned baby names. 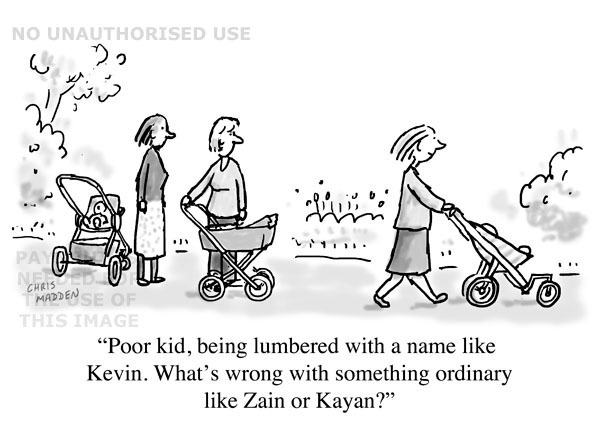 A cartoon about the trend for unusual and non-traditional names for babies. The fashion for non-traditional names for babies may be a symptom of the current trend towards hyper individualism, which may mean that ‘ordinary’ names are viewed as being too conformist. A cartoon about some men’s obsession with gadgets. 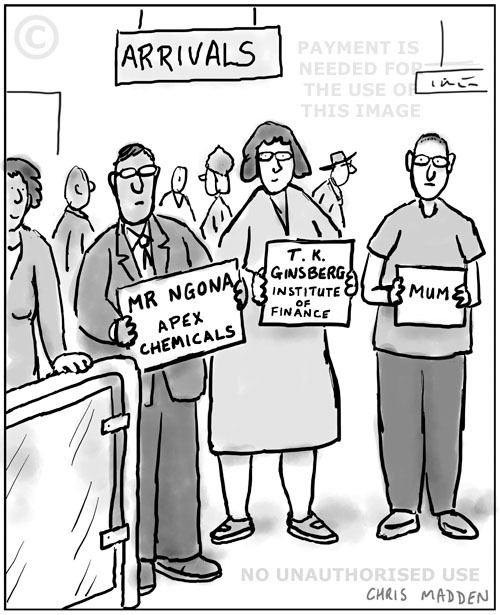 Cartoon of a young man waiting for his mother at an airport arrivals gate. He is holding a notice saying “Mum”. 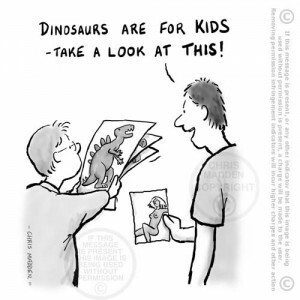 A cartoon about relationships between parents and their children. 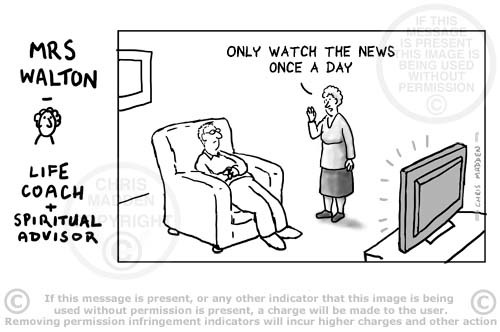 Cartoon about celebrities (and audiences) getting old. 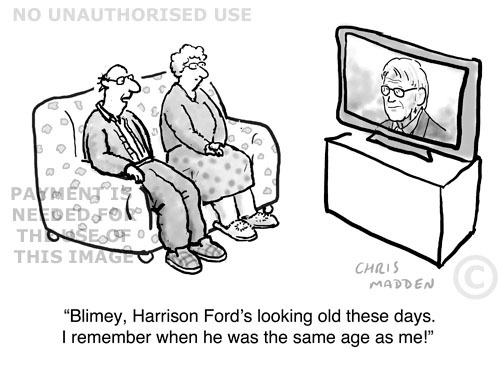 Cartoon of an elderly man commenting that a celebrity is looking old. The man is remembering what the celebrity looked like when the man himself was younger, and is forgetting that he is the same age as the celebrity. The celebrity in the cartoon is Harrison Ford. A cartoon about aging, denial, youth. A cartoon showing a woman thinking of putting her partner or husband into the recycling waste. He is standing idly thinking of sport while she is busy doing the household chores (in this case doing the recycling by visiting the local recycling centre). A cartoon about the most popular YouTube videos and the inanity of popular culture. 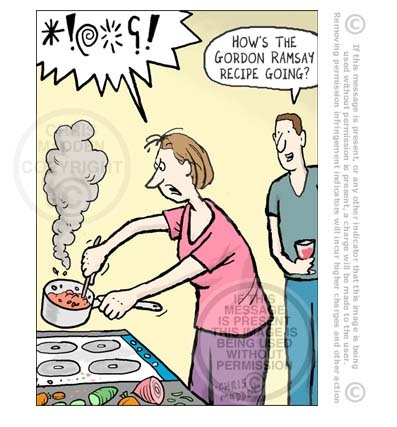 This cartoon was inspired by the fact that the song and video “Gangnam Style” was the most popular YouTube video today. I’ve got nothing against “Gangnam Style” (in fact I quite like it), but it’s a shame that the most popular areas of popular culture are usually the most inane/mildly amusing/superficial. The man in this image is implying that he’d like to see something a bit more intelligent topping the internet viewing figures. The cartoon is about internet trending, going viral, cultural inanity, popular culture. A comment on the hypnotic fascination with phones of young people. 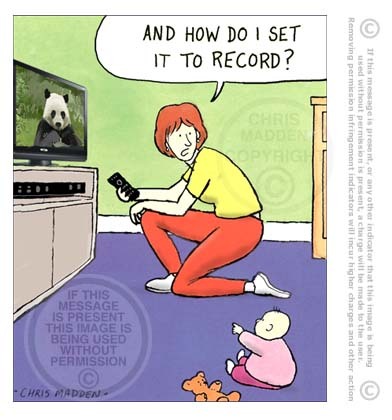 The cartoon is also about the way that children are socialised into dependence on technology and gadgets. The baby is ignoring the soft toys that are dangling in the baby buggy and is focussing completely on a cell phone (mobile phone). This is a joke about the problem of gluts of seasonal vegetables and fruit. 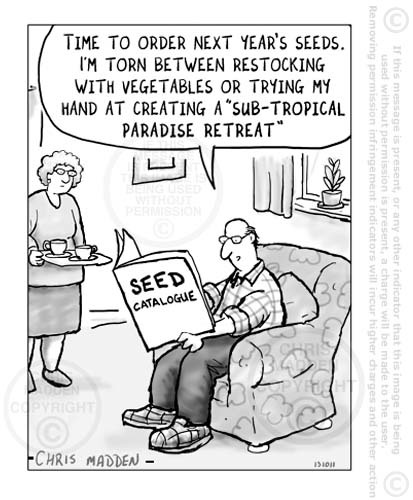 Garden design cartoon – down to earth vegetable garden or ostentatious designer garden? 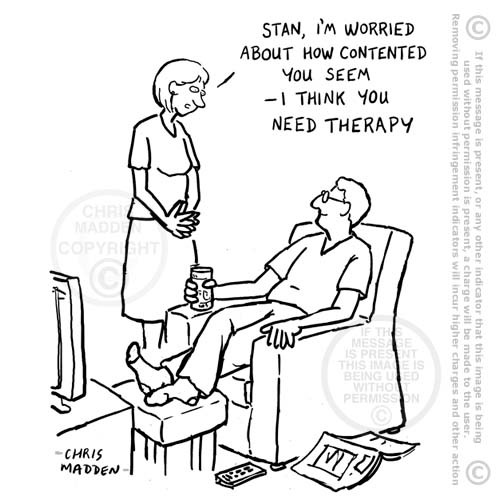 Part of the humour in the cartoon is that the man who is contemplating designing or planning a new garden is a stereotypical old age pensioner – a type of person who probably wouldn’t be interested in creating an aspirational garden design such as a designer garden. He’d normally prefer a traditional vegetable garden or allotment garden in which he could potter round rather than a high status garden that would (hopefully) impress his friends. The cartoon is meant to imply that an ostentatious high status garden design is more vulgar than an ‘honest’ vegetable plot. 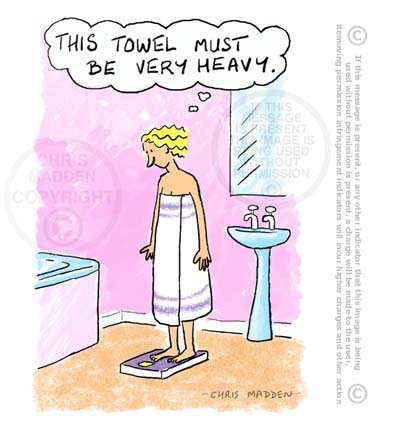 This is a cartoon about cultural types, social class, cultural stereotypes. 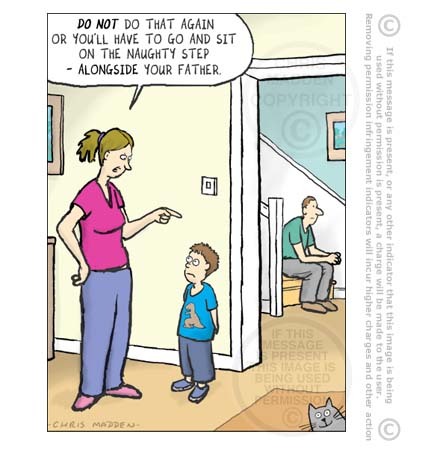 A joke about the problem of getting children away from the television and their computers. A joke about gardening and golf. Using a golf bag to carry gardening tools. Showing a man using a golf bag to carry his garden tools rather than to carry his golf clubs. Showing a gardener about to use some power tools in his garden. He’s asking his partner (who’s relaxing on the lawn) is she’s seen his ear protectors. A cartoon about insensitivity, lack of consideration for others, noise levels, noisy neighbours, noise abatement society, intrusive noise. The joke is also about male status and prestige (the need to be seen using powerful tools rather than lower status implements such as sweeping brushes and brooms). A man in his garden watering plants with a hose pipe (or with a watering can). His wife is commenting to a friend that it’s important for him to have at least 20 minutes of water play per day. 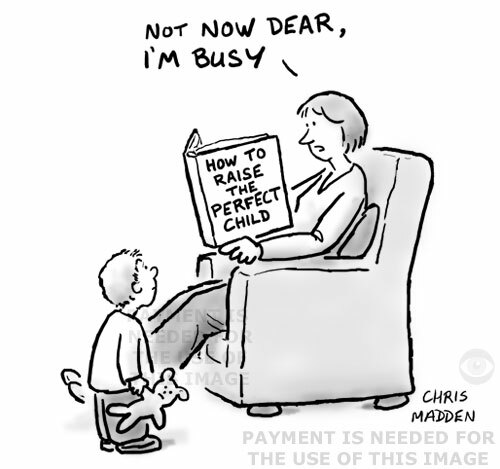 The joke in the cartoon is that water play is normally associated with children and child development, and not with adults, although adults benefit from such activity too. 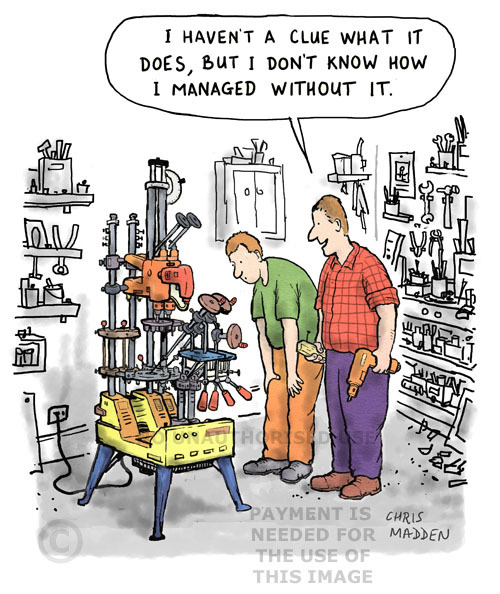 A cartoon about play, child development, leisure activities, watering gardens, irrigation, hobbies, male shed culture. A sundial in a garden as a decorative feature. A humorous illustration about procrastination, displacement activity, displacement activities, yesterday’s news. 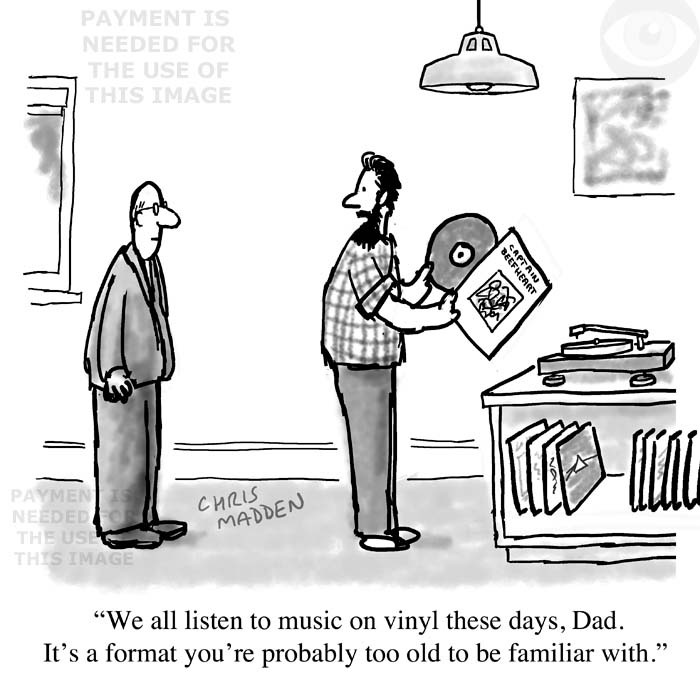 A cartoon about the way that it’s possible for the technology or tools relating to a hobby to become more important than the results of the hobby itself (Photography is another good example, where men become obsessed with their cameras rather than their photographs). A joke about the psychology of hobbies, leisure activities, passtimes, pass-times, men’s interests. It’s also about the way that some men will only use equipment that has a certain muscular masculinity – as here, a noisy power tool rather than a brush or rake. 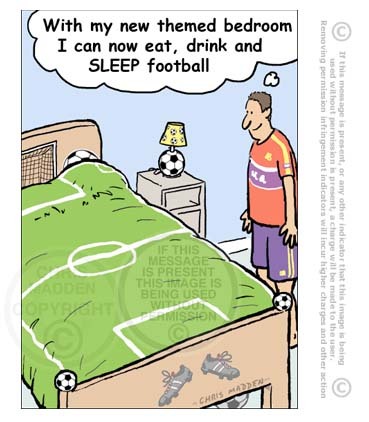 A cartoon about hobbies, leisure activities, passtimes, pass-times, men’s interests. Cartoon showing a man constructing a drive in his garden, with flagstones shaped like interlocking pieces from a jigsaw. The man has just finished constructing the driveway – to find that one of the pieces of the jigsaw is missing. This is a joke about the cliche that there’s always one piece of a jigsaw that’s missing. 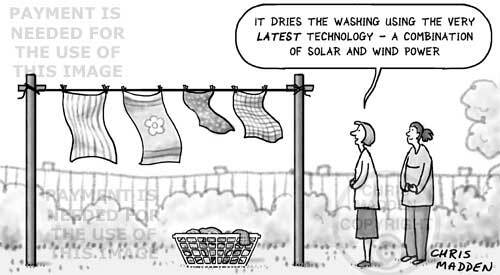 Cartoon about garden and outdoor lighting. Children no longer play physical outdoor games, preferring to play computer games and to use mobile phones and other electronic devices. Birdwatching cartoon. Misuse of English cartoon. A cartoon showing a father and son birdwatching. 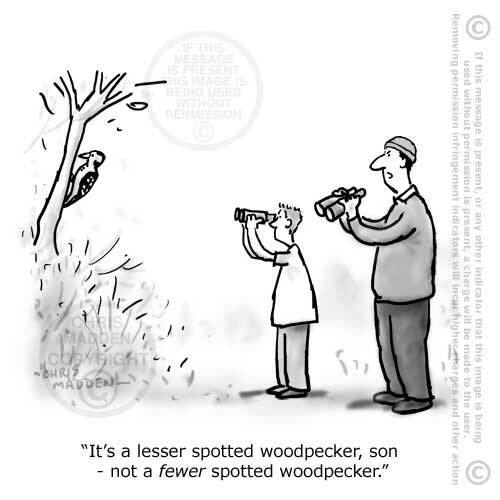 The father is correcting his son’s use of English – on seeing a lesser spotted woodpecker the son has mistakenly called it a fewer spotted woodpecker. This isn’t just a cartoon about birdwatchers. 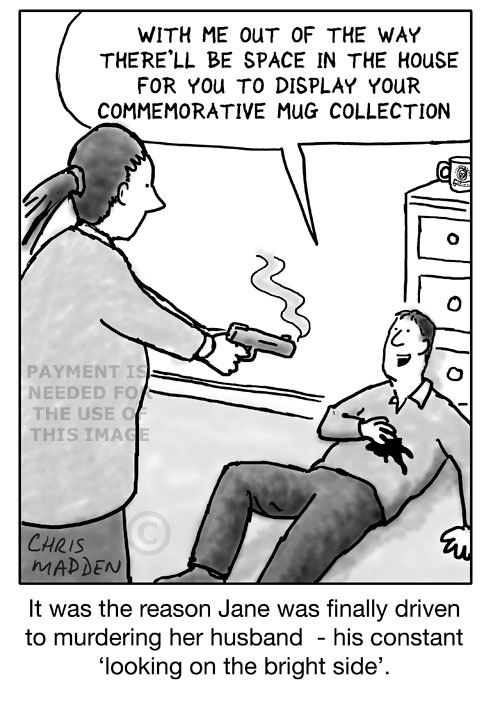 It’s also a cartoon about linguistics and specifically English usage or misuse. The mixing up of the words fewer and less is a common error. Getting annoyed or irritated by the misuse of English, especially at the less/fewer level, is commonly seen as a sign of grumpy middle age. The cartoon’s idea came to mind because of the RSPB (Royal Society for the Protection of Birds) Big Garden Birdwatch, an annual event in which people are encouraged to count the different garden birds that visit their gardens. Cartoon: a hat that looks like an animal head and a hat that looks like a human head. Cartoon showing a person wearing a hat that looks like an animal head and an animal wearing a hat that looks like a human head. A cartoon about fashion, hats, head gear, head wear, anthropomorphism, cuddly animals.